Following the deregulation of stage carriage licensing of the British Bus industry in 1986, many former National Bus Company subsidiaries quickly fell into private ownership. 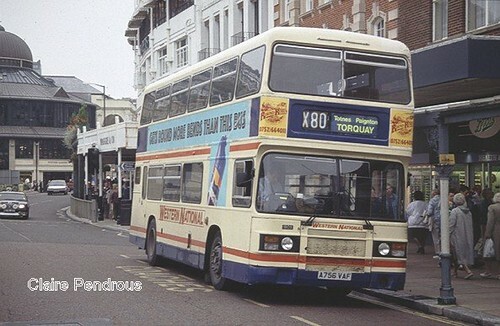 As a result, most of the new companies set about changing bus liveries to give their bus fleets a more up to date image, and also to show that the old NBC companies were now part of the past. As regards these liveries, some operators appeared to get it, while others clearly got it wrong. It just goes to show what a personal thing bus liveries are. For me, this livery is one of the better ones carried by Western National. My favourite was the badgers and flags livery but this was a big improvement on the old 'Birds eye' livery. Plymouth Citybus too has had its share of liveries with the old black red and white being my favourite which I know many people didnt like at all. I dont know that many people who are that keen on the present livery although its an improvement on the previous bland red white and grey. When a bus preservationist restores a bus one of the big choices they make is the livery they want to keep. This can cause real arguments in the anorak world with some people getting really upset if they dont feel its authentic enough or 'the wrong shade'. Many people got quite 'upset' when James Pratt painted his Bristol LH into a post dereg Devon General livery. The bus looked fantastic and the livery worked really well - but it never actually carried that livery in real life - for some this was a big sin! The truth is of course that the owner of a bus can paint it in any colour they want. Terry Partridge is currently working on L401VCV the first proper Dart new to Western National and I am really pleased that its going into Badgers and Flags livery. I also think that the Dart would look quite smart in the blue and cream livery of the Olympian above. Presumably Claire wouldnt be so thrilled! The Bristol VR always looked good in the blue and cream livery as Claire shows here.